Easy breathing. 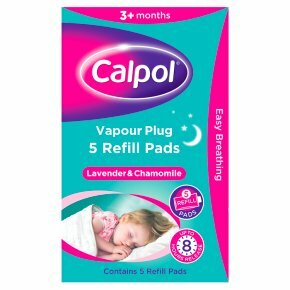 Up to 8 hours release.The CALPOL® Vapour Plug Refill Pads contain a blend of aromatic oils including lavender, chamomile, menthol, camphor and eucalyptus. These oils help to soothe and comfort your child at night time whilst helping to ease breathing. Each refill pad lasts for up to 8 hours. Do not use with children under 3 months of age or if you are pregnant. If you have asthma or other allergies consult your doctor before using. Do not eat the pads.<br><br>WARNING<br>Calpol Vapour Plug Refill Pads<br>Contains: Eucalyptol, Pentamethyl octahydroindenodioxane. Causes skin irritation. Causes serious eye irritation. May cause an allergic skin reaction. Toxic to aquatic life with long lasting effects. If medical advice is needed, have product container or label at hand. Keep out of reach of children. Wash your hands thoroughly after handling. IF ON SKIN: Wash with plenty of water. IF IN EYES: Rinse cautiously with water for several minutes. Remove contact lenses, if present and easy to do. Continue rinsing. If skin irritation or rash occurs: Get medical advice/attention. Dispose of pads in accordance with applicable regulations. Contains dipentene.<br>May produce an allergic reaction.